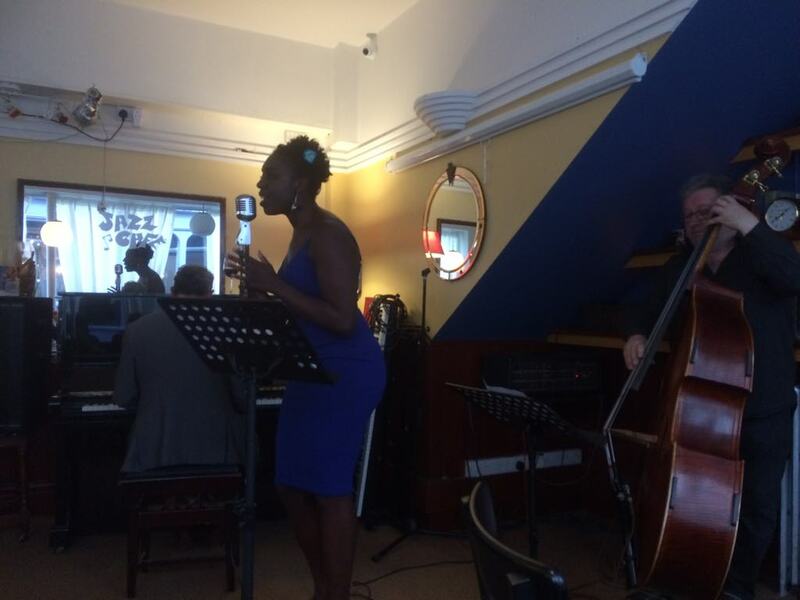 bebop spoken here: Niffi Osiyemi Trio @ Jazz Café - May 18. 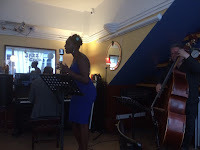 Niffi Osiyemi (vocals); Alan Law (piano); Paul Grainger (bass). Niffi, a final year medical student and a first year (first rate!) 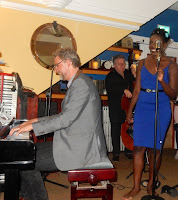 jazz singer wowed a packed Jazz Café downstairs bar who roared their approval demanding, and getting, two encores! Not bad going at a venue that, on a Friday night, is sometimes noted for its indifference - not tonight though! A choice selection of GASbook classics that varied from the tender to the not so tender to the frenetic - sometimes on the same number. It's still a work in progress, there were a few hiccups but none to mar the overall kicks the listeners were getting and we were nowhere near Route 66. Don't Get Around Much Anymore and Our Love is Here to Stay, were smooth, swingy songs that little prepared us for the Cry me a River to end all Cry me a Rivers. This wasn't a river, it was the North Sea at its most turbulent. The flood barriers well and truly breached! I Keep Going Back to Joe's, a longtime fave of mine - Nat King Cole and, later, Curtis Stigers both put their brand on it - didn't quite gell. Maybe it needs a little more work. Whatever, I do hope they keep it in the pad as Niffi has the voice for it. During the break, we discussed the show as it stood and concluded that, whilst Niffi's still raw around the edges, it's something that time will partially erode. Let's hope that time knows when to stop as that rawness is part of her appeal. The other verdict 'the jury' came to was that Law and Grainger were playing a blinder. The northeast is currently well-served for pianists and bassists and these two are way up high among the contenders. Set two began with the crowd handclapping in time [mostly], Law and Grainger 'vamping 'til ready' before Niffi hit for home with that ever-popular, triple-rhymer, I'm Beginning to See the Light. Undecided, a surprisingly restrained Black Coffee, They Can't Take That Away From me, Honeysuckle Rose and a song even older than Darktown Strutters Ball - Won't You Come Home Bill Bailey?. Bill left home in 1902 and, despite Ella's offer to do the cooking and pay the rent he still hadn't returned by 1963. Now, in 2018, It was Niffi's turn to apologise for that rainy evening when she turned him out with nothing but a fine tooth comb. 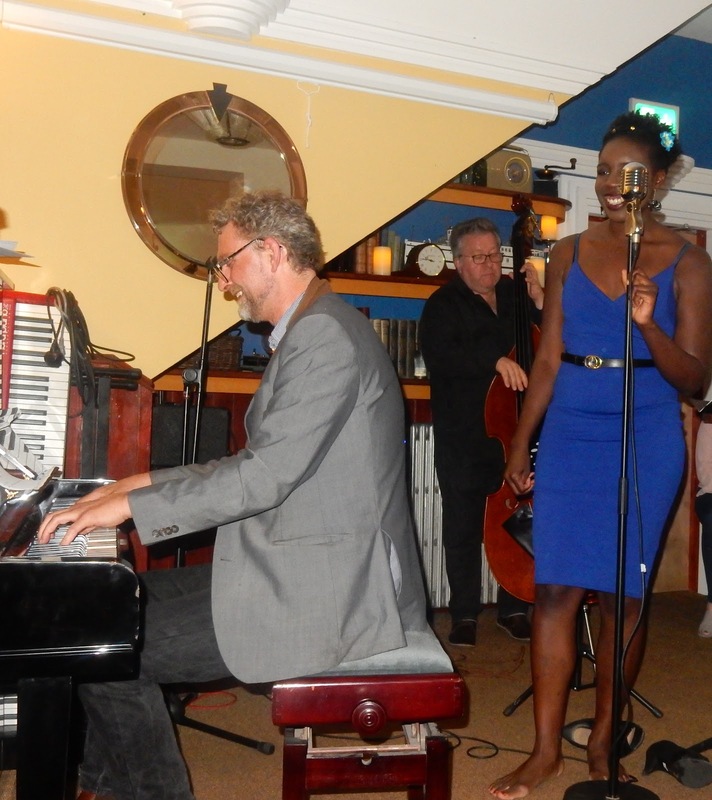 Using Ella's version as a launchpad, she once again had the room in raptures. Maybe the younger element was hearing this, and indeed all of the songs, for the first time! I think the late First Lady would have approved. I Love Being Here With You (the feeling was mutual) was supposed to be the last number but, of course, it wasn't, and nor was I Wish I Knew How it Felt to be Free. It wasn't until the last strains of Hallelujah I Just Love Him so had faded and the last handclap had ceased that we knew the show was over. A memorable evening - thank you Niffi, Alan and Paul. PS: The Niffi Osiyemi Trio can be heard at DJazz, the Durham City Jazz Festival held on June 1, 2 and 3 at various Durham City venues. Check it out.